A tropical tree up to 30 feet tall with glossy foliage. Native to West Africa. Flowers are white or yellow. Seeds are numberous, dark brown and ellipsoid in shape and embedded in pulp. The latex is used as a rubber adulterant. This plant is used by the Diola of Africa against infectious diseases. 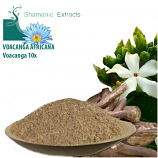 It has also been reported to have been used to treat mental disorders and as an analgesic. 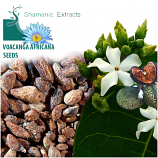 West African shamans are said to ingest the rootbark as a cerebral stimulant and the seeds for visionary purposes. Seeds may take a few months to germinate. Keep them moist and warm. 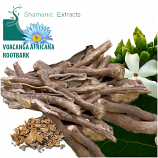 Reported to contain voacangine (carbomethoxy-ibogaine), ibogamin, plus many other unidentified alkaloids in the root & trunk bark, leaves and seeds. The total alkaloid fraction is said to be slightly toxic, acting as CNS depressants & hypotensives. There are no parts of Voacanga africana that are scheduled in the U.S. It is legal to both grow and possess.